XRCEL | Stay out of trouble, Turn up the Base: the Importance of Base Training for Marathon Runners. 25 Mar Stay out of trouble, Turn up the Base: the Importance of Base Training for Marathon Runners. We hear athletes saying these phrases like a broken record during the off season. I think sometimes athletes are saying it because they know it’s what they are supposed to say this time of year. The question is, when it comes to putting in the base miles, do they know why they are doing it, and are they doing it in the right way to gain the most benefit for their marathon racing. All phases and types of workouts have a specific purpose in your training cycle. I think sometimes base training is marginalized or over simplified because athletes don’t know its importance or how to incorporate it into their training cycles. Base training usually coincides with your initial training period as you start your build towards your peak fitness. Athletes can spend 2-4 months during this phase working on their foundational fitness. What you do in training and how you do it during this phase directly impacts your peak fitness potential as you approach your key race. The base training is the time when you build your aerobic engine and efficiency. There are several physiological reasons why base training increases your aerobic capacity. It increases the number and density of cellular mitochondria, which produce energy. It also improves your capillary systems, or the tiny blood vessels delivering blood to your tissues and organs. Think of this as improving your cardiovascular system’s plumbing by increasing the number of pipes. When it’s time to do the more intense work, the increased volume of your pipes will allow more blood flow so you can go harder. The second aspect of base training that many athletes lose sight of during this phase is functional strength. Not only do you want to increase your aerobic engine, you want to increase your functional running strength through both “on road” strength work as well as work in the gym. Putting both of these together will help your muscular endurance as you move into future training phases. The more you work on your aerobic engine now, the greater capacity you’ll have to do harder sessions as you start working your other systems. The stronger you are as you start adding more intensity the more power or force you can produce. It’s a pretty straight forward concept. I’ve always liked the analogy of thinking of your fitness as a pyramid. The bottom of the pyramid is your base aerobic fitness. The next layer up is your strength and muscular endurance. 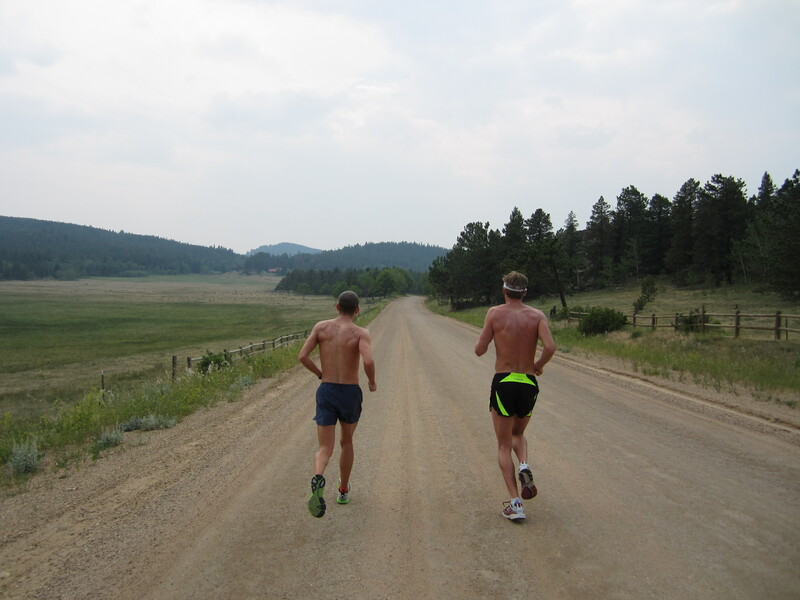 As you move up the pyramid, you have your tempo work, threshold, and anaerobic systems. The larger base you have on your pyramid, the higher you can build it. The reason it’s called base training is because it truly is the foundation of your fitness. During your foundation period, it’s also an excellent time to work on your training and racing nutrition. Because XRCEL is a newer product to the world of marathoning, you may not have had the opportunity to try it in your training and racing. Many athletes struggle with gastrointestinal (GI) issues during races from using gels and/or sports drinks. XRCEL’s patented micro-gel technology ensures that the glucose-loaded packets of calories are delivered in the right concentration, to the right place in your GI, and remains there longer to increase your body’s caloric absorption without upsetting your GI. In other words, during your base miles, its a great time to start experimenting with XRCEL as part of your exercise nutrition plan. Find the best formula for how many bottles of XRCEL per hour you like. Try drinking XRCEL before your sessions for increased energy during those workouts. You want your nutrition to be dialed in and spot-on come race day. The only way you’ll get to that point is to start working now and finding how incorporating XRCEL into your sessions works best for you. Now that you understand what base training is and how it’s beneficial to your marathon training, let’s discuss how to incorporate it into your training to be the most effective. The aerobic component is best done by slowly increasing your mileage (both through frequency and duration) throughout your base phase, but doing most of that training at a low heart rate. This is best accomplished by establishing a heart rate ceiling. That’s your speed limit, keep your heart rate under that number. You’ll need to find your own aerobic threshold. There are a lot of articles and on-line references describing self-tests to establish your threshold heart rate. From your aerobic threshold, you can establish your training heart rate zones. Your base miles are best done in zone 2 which is your aerobic pace. During your base phase, the majority of your miles should be here. You should slowly and carefully increase your running frequency (runs per week) and total mileage in this zone. The more time you spend here, the stronger aerobic engine you’re building. While most of your time should be done in this zone, that’s not to say you shouldn’t do any faster work. It’s good to do some work to maintain foot speed. The trick is to incorporate some faster efforts periodically without turning your run into a tempo run. You want to stay south of heart rate zone 3. Your goal is to avoid that “gray zone” or junk miles which is the feeling that you’re running pretty hard, but not too painful. The best way to maintain leg speed during your base period without training in the gray zone is to incorporate short fartlek efforts into your zone 2 runs. Try spacing out one minute hard efforts into your run, but allow enough time between each effort for your heart rate to come down and you still get time in zone 2. This will help when it’s time to start picking up the pace in your next training phase, your legs will still have some snap. Now let’s talk about strength, but more specifically functional strength. This is not about how much can you squat or dead lift, but rather building total body strength that’s directly applicable to your running. During your base phase, I think it’s the perfect time to work on your functional strength. Too many runners think the base phase is all about slow long miles. You want to come out of this period strong and with a great aerobic engine so your body can take the intensity as you start adding those sessions later in the year. You can always work on your functional strength in the gym. One to three gym sessions per week, depending on the athlete and how much time you have will build a great foundation. You want to work on your core, plyometrics, major muscle groups, but also work on mobility and activation exercises. There are a lot of resources where you can learn specific exercises or routines to get the specificity for the most benefit. Don’t worry, I can tell you that you won’t get “too big” by doing gym work. That’s an antiquated fear that circulates around old school endurance athletes and especially runners. I can tell you for certain that all of the top professional and Olympic distance runners spend a lot of time in the gym working on their strength. Take some time to talk to your coach, trainers at your gym, or research for yourself to find an effective gym routine to work on your base strength this winter. In addition to the gym, working on your functional strength while running out on the road or trails is one of the best ways to prepare for the coming marathon season and also to take your gym work and apply it directly to running. Remember that during this base period, you’re still working on your aerobic engine, so when you do any strength work in the field, the focus is on the muscle resistance and not on stressing your cardiovascular system. Try finding long hills that are not too steep and incorporate them into your runs. As you run up the hills, don’t focus on sprinting, but rather try to pick up your knees and really drive down and engage your glutes. I’ve found it especially effective on steeper sections to bound up, almost like you’re doing a jump from one stride to the next. Think of it as an over exaggeration of your normal running stride. To do this you’ll need to really slow down your pace and think of using your leg drive to propel you up as much as forward. You’ll feel the muscle fatigue building in your quads and glutes as you bound up the hill, but you’ll be able to keep your heart rate more aerobic than if you sprint up the hill like most impatient runners. Another great way to incorporate functional strength into your base phase is to put in sets of plyometrics directly after a run. As soon as you stop your run back at your car or home, try going right into sets of squat jumps, single leg hops, double leg hops, bounding, walking lunges, and you can even throw in sets of jump rope. You’ll already be fatigued from your run, so you’ll need to really focus to keep your form and push to get the most out of this strength work. If you can incorporate uphill bounding and post-run plyometrics into your normal running to supplement your base work this winter, I think you will notice significant strength gain come springtime. There is one more, little talked about, benefit to having a base phase as part of you your marathon build. I’m referring to the mental rewards. First, if you’re working on your base running as I’ve described here, you’re giving yourself a mental break from the intensity of tempo runs, track sessions, and other similar hard work. Even though strength work is challenging in its own right, it’s very different than that “I want to cry, this run is so hard” type intensity. Think of this time as important to recharge your mental and emotional batteries. You’ll need that mental energy as you start the big build to your key event. Execute your base phase correctly and you will be mentally fresh when you need to dig deep. The second mental benefit is that if you have a proper base training phase, you will have the confidence that you are stronger and have a better aerobic engine that ever before. You will know that because of this, your body will be able to handle a bigger work load for the rest of the year, setting yourself up for your biggest peak just in time for your “A” race this season.